Someone's 75th birthday is an important occasion in and of itself, but you can make it even more fun and memorable. 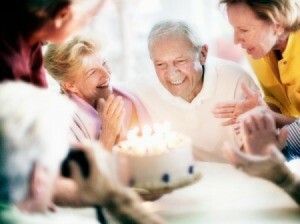 This is a guide about 75th birthday party ideas. Help! I have been chosen to be in charge of decorating for my fathers 75th birthday party at a church dining hall. I would like to do something fun but easy and not the traditional balloons and streamers something that our guests will remember. The color scheme will be dark blue, burgundy, and gold. Thanks! My family recently hosted an 80th birthday party for my grandfather and his twin brother at their church hall. It was great--almost like a family reunion (as since the "really old" members of the family have died and attendance at the reunions has been down). We did use the traditional streamers and balloons, however tried to use them in different ways. As for the (helium) balloons, we used these clustered together instead of flowers and made a balloon arch over the cake table. Balloons often can fill out the corners and upper space in the room and help the room really come to life--so don't rule them out of your decorating. We used streamers down the tables (red and blue--WWII vets--both of them) and also used confetti on the table. The real clincher was photographs--all through the years-- of them scattered about the room. Make photocopies of your precious photographs and you guests can take these home with them. If you feel comfortable, you could display framed photos and have a table of photo albums for guests to look at. These are real conversation starters and jogs old memories. Being 62 myself, I recall for 60. My children had a cake made with a pic of myself when i was a child on it. it was of course a Pic i had liked. The theme could be from his favorite past time or interest. It seems in these days ,we hear mostly negative. I am in the throws of planning my mothers 80th. birthday party. Here are some things I am doing for her party. For centerpieces, I'm coupling flowers and items I am collecting from her past. While guests are waiting I created a crossword puzzle about her, the first person finished will receive one of the centerpieces. I am creating mini photo albums as favors for each male guest and since the first gift Mom ever received was a gold locket, I'm giving every famale guest a locket. I'm having several members of our choir appear and sing several songs from her youth. I'm also hiring a D.J./Karaoke person and asking some of our singing family members to sing songs. That's as far as I have gotten so far. Hope you can use some of these ideas. If you or any reader has any ideas, please email me. I have come up with a few more ideas for my Mom's 80th birthday party so I thought I would share my new ideas. As I posted before, I am giving favors of mini albums for the men and lockets (Mom's first gift) for the ladies. I am putting together a collage of Mom's life in a unique way. I purchased several 2000 century US events CD's/Video. I am editing the Videos and fitting into the CD pictures of Mom's life during that period of time. There will be a total of 4 videos, each about 2 to 3 minutes long. The first will be the 20's & 30's. While the video is playing several members of her church choir will sing a song from that era. (I bought choir robes to make the event more striking) In the middle of the show my brother will sing "remember when" and I will show pictures of her with her children and grandchildren. The next part of the entertainment will be skits performed by her children and grandchildren entitled "lessons learned from Grammy"
I am still looking for a great finale. If anyone can think of something really neat. Please post a response. I don't know if these ideas will work for you but they sure were a hit at my father's 80th birthday party! I constructed a scrabble board using his name in the center squares and then constructed the rest of the board using words that describe him. Building the board was a lot of fun and I used words like leader, respected, loved, visionary, mentor, witty, creative, generous, worldly, wise, energetic, dynamic, noble, and I was lucky enough with the layout to include best (down) father (across), building the father on the "t" of best. I also managed to fit in little but also descriptive words of my dad, like nice and fun to fill in spaces. I bought a scrabble board at Target and called the number on the instructions and had them send me the pieces for the upscale board in burgandy. I wrote my father's name and "best father" in that color and did the rest of the board in the normal color. I mapped out the board on scrap paper and then simply glued the letters on the board. I then had the board framed with a 3" mat. It made a great gift and hangs in my father's office. Another idea that worked really well was, I found pictures of my father with each of the people invited to the party. I framed each picture in an inexpensive 3" frame from Michael's and used them as place cards at each setting. Hope these ideas helped. I purchased a "Remember When..." book dated 1926 that has events in the year of my mom's birth, you can usually get these books at Cracker Barrel. or newhaven.com. I then got information from this booklet, ie gallon of milk $.56, new car $360...I put them on the outer edges of an 8x10 copy paper, put her birthday and a black & white photo of her in the middle, went to The Party Barn, purchased -100- thin paper placemats 25 for $1.25, took them to the printer and they pressed my 8x10 paper on to the placemats to set on the tables. I have been trying to find some unique party favors for my mom's 75th birthday party. Any ideas??? You guys are really good at this, hope you don't mind, but I think I'm going to use some of these ideas for my fathers birthday. One as well that I thought about doing along with this is playing a game with all the relatives and friends to see how well they know some of "his" history. Having a couple of different groups of questions and which ever table answers the most questions out of that group of questions would win a door prize. Editor's Note: Ideas on ThriftyFun are shared for others to use so of course we don't mind. Have fun with it! For my mom's 75th birthday, I am having a game for everyone to play. I found famous people born on the day (not year) she was born, and gave a description about them. I also added a pic of them, but whited out their faces and put a question mark there. I also have questions about well-known events that happened on the day (not year) she was born. Like...on May 16th in 1929, an awards show that is still around today made its first debut. Which awards show is it? I have a bonus question at the end of which weekday my mother was born. I am going to be giving away a GC to a restaurant for the top scorer. What are the best ways and programs to celebrate your boss' 75th birthday? Can you help me? Thanks. Cake and food for sure. Any hobbies?? Are you inviting others? Will there be gifts?? I would pick some games, and perhaps find out what happened the year or date he was born and mention those events. I would have it at Lunchtime. If you dont have a break room, take him out for lunch. 75 is a milestone birthday. I am looking for ideas on how to celebrate my dad's birthday. He is in a nursing home. He can still walk with help, he has partial memory loss. I will be having the birthday at my house with close family members. I have to take him back to the nursing home within a period of three hours so that is the time I have. Some ideas for your Father's Birthday would be: First food. I mean little snacks that won't go stale such as life savers, lemon drops etc. Older people usually have dry mouth resulting in bad breath, so little candies are always nice. If he is a sweets person, home-made cookies, or a piece of his favorite flavor cake. (I think most men like apple/spice flavors.) A little bottle of fruit juice. A box of those super aloe moisturized kleenex tissues, (or Puffs.) Get the best expensive ones. Put a bow on top. Older people have a problem with a drippy nose for some reason. There is a magazine out there with the most beautiful pictures of birds. The pages are glossy and all the pictures are wonderful. I don't know the name of it, but if you Google "bird magazine" you can probably find the name of it. A National Graphic would be nice. Any magazine with lots of beautiful pictures would be great. Most older people can't concentrate very long reading articles, but like to escape their confinement through pictures. Then there are the toiletries. An unusual and nice shaving cream such as Aveno (sp). Something extra nice that he has never used before would be a treat. A hypo-allergenic bar of soap such as Basis. Older people's skin gets thin and soaps are harsh. I would make a slide show of pictures and show them on a big blank wall where everyone can see of different stages of his life while raising his family. He might enjoy reliving some of those memories and ask him what he remembers about some of the events (have him interact with you and his guests rather than just to sit there). This could turn out to be one of the most wonderful birthdays he has ever had:-) and a great way for you to show him what a wonderful life and family he has earned. I am planning to celebrate my mom's 75 birthday and I need ideas. Send all the people an invitation to do a card shower and inundate her with cards, have old friends family write or email some cute stories they have about her and make a scrap book or dvd. Brunilda: I'm just a month and a bit more than 75. Tell your Mom I'm a secret admirer of hers. I am having a 75th surprise b-day for dad. He isn't in the best of health, but can get around just fine in a wheelchair. I am looking for entertainment ideas. I am wanting ideas that aren't too over whelming and are convenient for the wheel chair. I have taken a few other ideas from this site such as the journal idea, placemat, and possibly a quilt square for the shoulders. Thanks. Triiva game/questions based on his life. Folks answering correctly get some little token prize. He gets to be the center of attention for the whole thing. I am looking for an affordable place to have my 75th birthday. Thank you. My church group has used a meeting room at a local library at no charge. I think the only stipulation was that the event be open to the public. Other options are a church, VFW, Moose or Elk Lodge, etc. Or maybe a community center or YMCA. What would be a good skit for a 75th birthday party? Try dancing. Go back to when person was born and have music from that time and have a couple dance to it. Then go ahead 10 or 15 years and do the same, another 10 or 15 years, repeat. May have to research into the popular music of the times and the dances. If do every 15 years would have 6 dances to do. birth, 15 years, then 30, then 45, then 60, then 75. Have fun. I am looking for ideas on throwing a 75th birthday party for mom. This is a fun idea. You can take all the milestones, college graduation, marriage, jobs, family everything that makes your mom "mom" and turn it into a newspaper with photos and more. Just make sure you order two, as she will want to keep both sides of the news print for keep sakes! My Dad's 75th birthday is coming up, what I was thinking of was having a surprise party with his friends, and then have another party with just family. We have a large family, any ideas? I was looking for special things that happened during the teen years (I figured 1947 to 1954 give or take a year) http://www.ask.com/web?qsrc=2417ando=0andl=dirandq=Important+events+of+1947+to+1954. Possibly that would give you an idea to focus on. Then there is always finding what happened specifically during the first year of birth and focus on that. Personally I would make a list of important dates in his life and do an amateur "This is your life&quot". Birthday, younger siblings birthdays, graduation HS, graduation college, wedding, birthdays for children, major job changes, serious moving dates, birthdates, wedding dates of children, birthdays of grandchildren, best friends, favorite cars, etc. I'm starting my planning early for my mother's 75th birthday party in May, 2013. I'm having a time deciding what to do. My daughter suggested whatever theme we go with, we ought to use her birthstone color which is emerald. My sisters and I thought of a masquerade of some sort. We don't want it to be formal, but we don't want it to be jeans and a tee either. The party definitely has to be fun, lively, silly (almost), yet unique. Any ideas? My neighbor (who turned 80 in January) was treated to a surprise luncheon at a local restaurant. The highlight of the event was the movie of her young life as a mother through to becoming a great-grandmother. There was not a dry eye in the house and she said she has watched it many times, laughing and crying the whole time. I have been nominated to have a birthday party for my father-in-law who will be 75 years old on May 6th of this year.